Only 26 years old and already one of Sweden’s hottest chefs, Niklas Ekstedt has been impressively successful since he opened his own restaurant five years ago. Now the owner of two restaurants, the author of a cookbook, the recipient of numerous honors and distinctions, and frequently featured on national television and in publications, Mr. Ekstedt acknowledges that food is the great love of his life. Raised in the northern Swedish town of Åre, Mr. Ekstedt says he has always been interested in cooking and in fact doesn’t remember a time before he knew that food would be his career. He credits his parents with encouraging and supporting this pursuit. The Ekstedt family – Niklas, his parents, and his two younger brothers – grew produce in their garden and cooked together at home. His grandmother in particular was a good cook and she inspired him with her commitment to local products and the national fare. The family generally made traditional Swedish food, which Mr. Ekstedt feels is good as a base, but a bit narrow. He prefers to let himself be inspired by other cultures and cuisines and has been influenced in particular by France and Spain. Mr. Ekstedt had the opportunity to experience these other foods because his parents were dedicated to helping him succeed in his chosen field and they supported him financially and emotionally as he traveled around the world to work in the top kitchens and, later, when he decided to open his own restaurant. After he attended a restaurant and tourism high school program in Åre, Mr. Ekstedt worked at a variety of well-regarded restaurants in Europe and the US, including El Bulli in Barcelona, Charlie Trotter’s in Chicago, and French Laundry in Yountville, California. When barely in his twenties, he realized that he was ready to open a restaurant of his own. He admits that one reason why he chose to do this was because he knew he would receive “recognition and publicity because of my age,” though he didn’t at all expect the level of success he has achieved so quickly – he thought it would take at least ten years. More importantly, however, than the publicity, Mr. Ekstedt craved his own platform and the freedom it would provide. “I don’t like being told what to do. I like doing what I want,” he says, comparing himself to an artist who has to answer to no one. Having his own restaurant is “a way of expressing myself.” Still, he was aware of the responsibility such an endeavor would require, which is why he has been so grateful for the help his parents have provided. 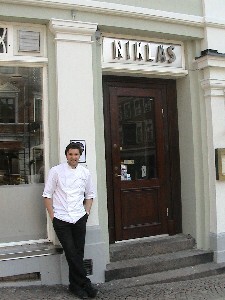 He has found it somewhat difficult, business–wise, to run Restaurang Niklas; for example, at the beginning, he wasn’t always sure how much of each product he should buy. Mr. Ekstedt says he also has been too trusting and too naïve, and that he has learned the hard way. Nevertheless, it has been a good experience and education for him. Though he is from the north of Sweden, he chose Helsingborg, a southern city with a population of about 150,000, as the location for his first restaurant because he spent some of his childhood years there and has meaningful ties to the city. Also, of course, in a smaller city, there often is less competition and it can be easier to break into the food business. After only a few years, Restaurang Niklas has already been hailed as the best restaurant in Sweden outside Stockholm and one of the best in the entire country. The food at Restaurang Niklas is innovative and French-inspired and not infrequently with a touch of humor. Mr. Ekstedt prefers to cook the foods he finds inspiring and enjoyable, rather than what is trendy, though he certainly does use some of the most modern techniques, such as ‘foam.’ Some such dishes have included tender skate wing baked with miso and paired with pickled oyster, or grilled foie gras with hibiscus jelly, or a seafood salad served over fried quinoa and Gewürztraminer wine foam. He also likes updating classics. His take on the salade niçoise, for example, was composed of yellowfin tuna, poached quail egg, anchovy, paper-thin slices of dried potato, and an olive and caper cream. And his version of the traditional Swedish ‘Jansson’s temptation’ had fried anchovy, glazed red onion, and potato ice cream, which provides an exciting contrast to the typical heavy meal. Creating a dish for his restaurant is a long process for Niklas Ekstedt. His method for coming up with a recipe is to start with a specific, often seasonal, product, then to consider its possibilities as well as experiences he has previously had with it. Mr. Ekstedt does this primary work himself and then, once he has solid ideas for a dish, he meets with the chefs who work for him. 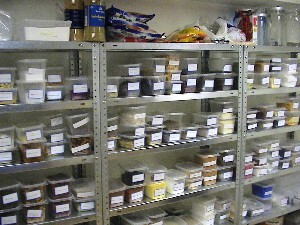 They have intense discussions, including about which other products might best complement the dish, and they generally work on a recipe for days. Even once they have decided on a final version and put it on the menu, Mr. Ekstedt and his chefs often tweak it, continually attempting to perfect what is generally already outstanding. Two years ago, Mr. Ekstedt opened a second restaurant, in the small town of Viken, about twenty minutes from Helsingborg. Viken is, like Helsingborg, right on the water and, as such, is an idyllic place to have a summer house, as the Ekstedt family does. Niklas Viken is a casual restaurant beside the harbor and the food served there during the summer was less pricey and less gourmet. Entrées (85–245 kronor each, $11–$33) this summer included prosciutto pizza, brioche topped with cream cheese and chanterelles, pasta with smoked boar, and baked, rum-marinated pineapple with coconut foam. The location is lovely and the atmosphere relaxed. While Mr. Ekstedt was occupied with the new restaurant in Viken in 2003, the original place in Helsingborg was being remodeled. It now has a wine bar, a bistro, a more expensive fine dining area, and a chef’s table. The bistro (80-245 kronor, $10–$33) offers tapas options that include gazpacho granita, lemon brisket, and candied plums with goat cheese, as well as a regular menu, with dishes such as apricot-glazed quail with roasted corn and almonds and a nectarine salad served with a lavender-sugar donut. The more expensive section of the restaurant offers a seven course meal for 795 kronor ($105) and current dishes include lobster carpaccio with passion fruit and vanilla, miso-marinated skate tempura with caramelized shrimp, roasted pheasant with salsify and bacon, and traditional Swedish curd cake with fig compote. The chef’s table, a money-making trend currently appearing in many top restaurants, allows guests to dine in the kitchen itself, where they can watch the chefs at work (995 kronor per person, $130). Mr. Ekstedt himself will try any food – except for bananas, which he strongly dislikes and refuses to serve – and he finds pleasure in eating and cooking. He knows, however, that many people think preparing meals is a tedious and uninteresting activity, so he recommends that those cooking at home let themselves simply be “inspired everyday by the food” and to have fun with it. He thinks that it is better to keep cooking simple, by buying good quality products which don’t need a lot of accompaniments and processes. Mr. Ekstedt especially likes and suggests using fresh herbs. When he’s at home, though, he confesses that he rarely cooks. The accolades have been heaped on Niklas Ekstedt by magazines, food writers, other chefs, and even employees. Restaurang Niklas was called the “Restaurant of the Year” by the Swedish financial newspaper Dagens Industri and was put at seventh place in the Swedish White Guide’s list of top restaurants in the country. He has also been written up in Gourmet, among many other glowing reviews. The crowds at the restaurant show that the general public appreciates the food, as well. The people who work for Mr. Ekstedt truly admire him, and say they learn something new from the boss every day. Some of the top chefs in the world think highly of him, too. Chef Charlie Trotter has “nothing but kind words” to say about Mr. Ekstedt. 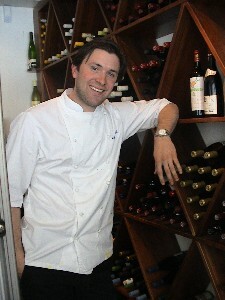 “He was an amazing team player and his understanding of fine cuisine was extraordinary. He was a delight to work with.” Chef Ferran Adría of El Bulli remarked on Mr. Ekstedt’s “great professionalism” and creativity. Since he is already so respected and his restaurants have been so well–received, it is hard to imagine what could possibly be next for Mr. Ekstedt. But as someone who generally works from 9 am until 1 or 2 am and who says that food “means more to me than anything,” he is clearly dedicated to his career and ready for his next accomplishment. Mr. Ekstedt published his first cookbook last year and it had interviews with him and people who have inspired him or otherwise been important in his life, recipes, and lots of pictures; he hopes an English version will also be published at some point Also, he has been on Swedish morning television regularly, showing viewers how to cook fairly simple dishes, as well as taking over as host of a popular food show that used to be run by chef and author Tina Nordström. 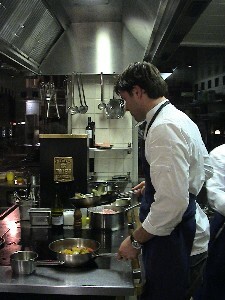 And he has started offering occasional cooking classes at the Helsingborg restaurant, too. The most tantalizing possibility is that there may be another restaurant in his future. Mr. Ekstedt says he would like to cook for a broader audience, so perhaps he is considering an informal café. Regardless of what Niklas Ekstedt’s next feat will be, it is easy to believe that it will be done thoughtfully, carefully, and successfully. Helsingborg is about an hour and a half north of Copenhagen, Denmark. Brett Jocelyn Epstein is originally from Chicago and now lives in southern Sweden. She teaches English at a variety of levels, translates from Swedish to English, copy edits, and writes articles, stories, and educational material. Her first book, Ready, Set, Teach! Ready-Made, Creative Lessons for the English Classroom, was published in Scandinavia in September 2005. For more information about Brett, please see her website http://www.awaywithwords.se/.